The flaming Heat takes the Game 2 against Oklahoma Thunder at the Chesapeake Energy Arena in Oklahoma City. 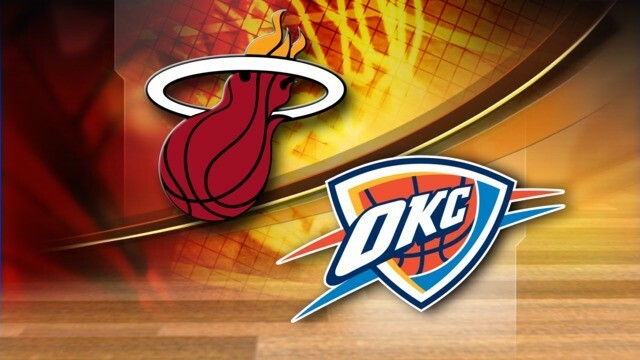 NBA Finals 2012 Game 2 scores Miami Heat 100 - Oklahoma City Thunder 96. Miami Heat took the four quarters in game 2, but Kevin Durant, who had 36 points on just 20 shots, led a Thunder revival in the second half that made you wonder how his team had ever trailed the Miami Heat by 13 points during that game. This was the first time that Oklahoma City Thunder lost at home since the playoffs. If you're looking for Game 1 results, just refer to this link. Meanwhile, NBA Finals 2012 Game 3 will be played at the American Airlines Arena in Miami, Florida on Sunday, June 17. Comments or suggestions about "Miami Heat defeated Oklahoma Thunder in NBA Finals 2012 Game 2" is important to us, you may share it by using the comment box below.